Hurry! This item is going fast! TigerChef Plastic Coat Check Tags 1-100 will help get coat room check systems organized in restaurants, catering halls and theaters. These coat check tags feature large black numbers on a white background that make them easy to identify, while their sturdy plastic contruction makes them hard to rip or break. Measuring at 2-1/2"x 1" they are easy for your guests to store in pants pockets or purses. 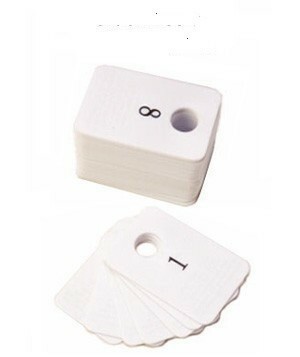 This product contains 2 matching sets of numbers, so guests can recieve one number and the coat check staff can store the corresponding number on the guests coat hanger or coat pocket. Reusable, highly durable and practical, plasitc coat check tags are an important part of ensuring proper coat room service. What type of hangers to these fit? They fit standard size wire or plastic hangers.